Fossil fuels are created by the decomposition of prehistoric dead plant and animal matter. The three major fossil fuels on earth are coal, oil, and natural gas. They were formed millions of years ago. In fact, they were formed before dinosaurs roamed the earth! Hence the name “fossil” fuels. They were formed during a period when the planet was covered with swamps containing huge ferns, trees, and other leafy plants. During this time, the oceans were covered in huge blooms of algae. As the plants and algae died, they sank to the bottom of the oceans and swamps, forming a thick spongy like substance called peat. Over many years this peat was buried in sediment and formed into rock. 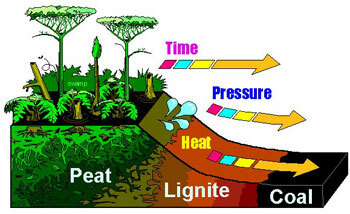 As the pressure from layers and layers of rock built up, the peat turned into the coal, oil, and natural gas that exist today. Fossil fuels are now a valuable resource used in the production of energy, plastics, and agricultural chemicals. Fossil fuels are made up of carbon compounds; carbon provides the building blocks for life. When humans burn fossil fuels for energy, greenhouse gases are emitted as a byproduct. Greenhouse gasses prevent heat from being reflected back to space and consequently warm the planet. Carbon dioxide is the most common greenhouse gas emitted into the atmosphere when oil and coal are burnt. When carbon dioxide concentrations in the atmosphere increase, the ocean acts as a sink and helps to remove the excess carbon dioxide. This is great as it prevents the atmosphere from warming to quickly; however, the ocean becomes more acidic. As carbon dioxide concentrations in the ocean increase, the ocean must respond. There is a chemical compound in the ocean known as calcium carbonate. Calcium carbonate is used by arthropods, mollusks, and corals to form their shells and exoskeletons. When carbon dioxide enters the ocean, it reacts with the water, making it more acidic. In an effort to buffer this acidification, the available calcium carbonate in the ocean is dissolved. This equates to less material available for the snails, clams, and mussels to form their shells. Now they must spend increasingly more energy creating their shells, and less energy on feeding and growing. This results in physiological stress which leads to slow growth rates and high mortality. With the levels of carbon dioxide still increasing, and the rate of ocean acidification on the rise, the fate of our hard shelled friends is unsure. Can they adapt to these changes? Or are these changes happening too fast? The good news is, the answer to the problem is simple, stop burning fossil fuels and keep them in ground where they belong.